What is an embedded post? 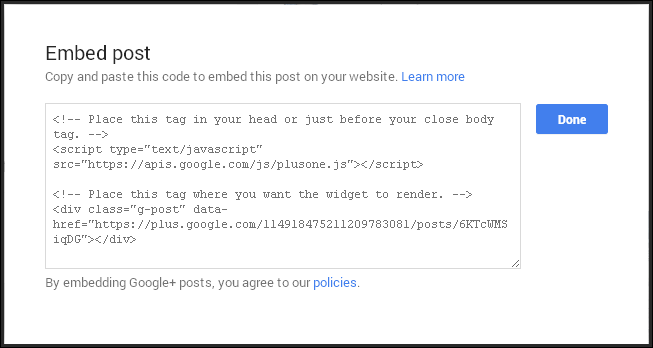 A new feature on Google+ has been released enabling you to take any public post (except communities at present) and embed it on a website just by adding in a simple code. It really is simple. 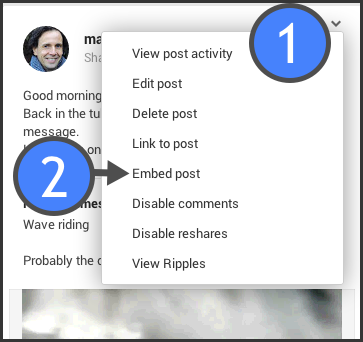 Why embed a Google+ post? First find a post you want to embed. 1. Click the down arrow in the upper right corner of the post. Next, you will see a box appear - copy that code completely. Next you will want to paste it into your website. Once you have logged in (using Wordpress as the example) choose a page or blog posts in which you want it to appear. Then in ‘text view’ (not visual) you add the complete text to the place within the blog post. 1. Click 'text view' in the upper right. It is a little confusing re: ‘place this tag...’, so know that you can simply drop in the complete text and add images or content above or below it. It is just as simple as adding the embed code of a YouTube video. What type of posts are supported? Posts with images - The post will render with the image. Clicking the image directs the visitor to the image view on Google+. Posts with videos - The post will render with the video. Clicking the video will play the video within the embedded post. Posts with links to a community - Your visitors can click through to view the community as they would in the stream. This works for Gifs too!